Manchester City have signed central defender Kolo Toure from Arsenal for £14m on a four-year contract. Toure, who had seven years at Arsenal, passed a medical on Wednesday and is City's sixth signing of the summer. Boss Mark Hughes said: "It is no secret that we have been looking to strengthen our defence and in Kolo I feel we have recruited a world class player." Toure told City's website: "I am still at an age, 28, where I feel I am at my peak and will play my best football." Hughes, who recently failed to lure Chelsea centre-back John Terry to Eastlands, added: "Kolo has been a central figure in a strong Arsenal team for many years, and I have been an admirer of him for a long time. "He is strong, quick, reads the game well and will be an influential figure in the dressing room." Toure was linked to City in January and although Arsenal said then he was not for sale, the London club have now decided it is time to let him leave. "For me it was time to move but only for the right club and I feel that Manchester City is that club," added Toure. "The ambition here is clear to see and is big. Everyone knows this club is moving and that is really, really important. "I still want to achieve things and I feel as though I can bring something to City and that is what I will be striving to do. It is not just about quality on the pitch it is about blending as a team and with my experience I think I can help City do just that." 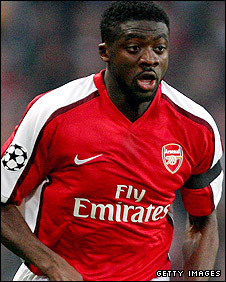 Toure had been with Arsenal since 2002 but failed to hold down a regular starting place last season. He handed in a transfer request in January, which was rejected by the Arsenal board. The Ivory Coast defender played for Arsenal on Monday night in a pre-season friendly in Hungary and in all he played 326 games for the Gunners, scoring 14 goals, and had two years left on his contract at the Emirates Stadium. As well as missing out on Terry, Hughes had a £15m bid for Everton defender Joleon Lescott rejected earlier this month. But the Gunners, who have already sold striker Emmanuel Adebayor to City for £25m this summer, have been more receptive to offers from the oil-rich Eastlands club. On top of capturing Adebayor, City have already brought in former Manchester United forward Carlos Tevez, midfielder Gareth Barry from Aston Villa and striker Roque Santa Cruz from Blackburn for a total of about £55m this summer. Meanwhile, defender Nedum Onuoha has ended speculation over his future by signing a new five-year contract at Eastlands. The 22-year-old, who came through City's academy, had been rumoured to be on his way out of the club due to the number of high-profile additions to the squad, but he has pledged to fight for his place in the team. "Unless you are continuously improving you shouldn't expect to be in the team," said Onuoha. "I want to improve on last season and I am raring to go." Onuoha broke into City's back four midway through last season and never relinquished his place with a series of composed performances.